Historical information about the Thwaite. surname.Recorded in a number of spellings as shown below, this is an English surname but one of pre 7th century Norse-Viking origins. It may be either topographical or locational, and is derived from the word “thveit”, meaning a clearing or farm. As a topographical surname, Thwaite(s) denotes residence in or by such a place whiilst as a locational surname it originates from any one of the various places called “Thwaite”, found in several parts of Northern England and East Anglia to the south. The surname development from ancient times includes examples such as Alan del Twayt of Yorkshire in 1301, Robert del Twaytes of the same county in 1379, William Twaytes of Suffolk in 1492, and Matthew Thwayts of Oxfordshire in 1618. The various ‘modern’ spelling forms include Thwaite, Thwaites, Thwaytes, Thoytes, Twaite, Twatt, Twaites, Tweats and Twite. The plural forms denote “of Thwaite” and are similar to the French ‘de’. An example of a recordings taken from surviving church registers is that of the christening of Thomas Thwaite, the son of John Thwaite, on January 22nd 1461, at Lofthouse with Carlton, in Yorkshire. An early coat of arms granted to the Thwaites family of Marston in Yorkshire, depicts a gold fess between three gold estoiles on an blue shield. The first recorded spelling of the family name is shown to be that of Ralph del Thweit. This was dated 1206, in the Pipe Rolls of Norfolk, during the reign of King John of England, 1199 – 1216. Throughout the centuries, surnames in every country have continued to “develop” often leading to astonishing variants of the original spelling. ‘ Copyright: Name Orgin Research www.surnamedb.com 1980 – 2010. Details of Thwaites family from the Grewelthorpe area.Mark Andrew & Joy Hatchett has sent the following information. MAGGIE THWAITES. Born 2 June 1883 Grewelthorpe. Died 26.6.1952. Married 21 April 1900 to Robert Henry Prest. of Kirkby Malzeard. They had a son Bertram Prest. Grewelthorpe school records show that Maggie was the daughter of Arthur. She started Grewelthorpe school in June 1888 and left to go to work in 1897. In 1911 living Kirkby Malzeard. 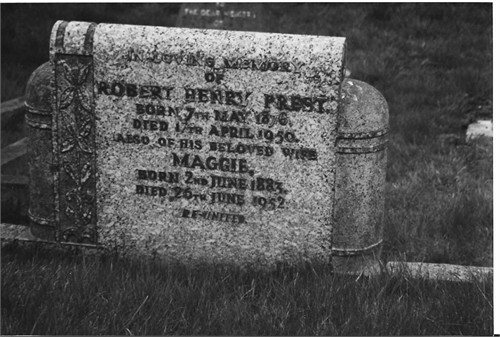 Grave of Robert & Maggie in Kirkby Malzeard churchyard. Robert & Maggie [nee Thwaites] Prest. Thanks to Joy Hatchett for photo. Adrial Walton has sent the following request for information.I am interested in the Thwaites family which I am researching on behalf of a friend. On the Grewelthorpe genealogy website is listed a John Thwaites, born 1880. I know that he married Hannah Maria Jones in June 1913. On the marriage certificate his occupation is given as woodman, hers as domestic servant, the 1901 census has him entered as a stocksman. It therefore seems possible that both John and Hannah Maria were employed by a large house or estate at the time of their marriage.The witnesses of the marriage were Robert Henry and Maggie Prest. This would appear to be the Maggie Thwaites mentioned by Mark Andrew in his post to your site dated 7 Jan 2009. She was John’s sister.Hannah Maria’s father is given as David Jones, a collier, and I understand from my friend that she came from Wales, though exactly where is not known. The combination of names and occupation is by no means unique so that I have been unable to identify her family unambiguously from census returns. I therefore wonder if records survive from any houses or estates (Hackfall?, Bramley Grange?) in the area which might give more information about employees. I would be very grateful if you have any suggestions or if you could put me in touch with anyone else who might know. Thanks to Stewart Hall for information about the Thwaites & Hall families. Also from school, census & Parish records. AMELIA THWAITES. Born 29.5.1885. Dau of Arthur & Lizzie.. Started Grewelthorpe school in August 1890 left 1898. In 1901 a servant in Bedale. 1911 Housekeeper for brother John and widowed Father. ANN THWAITES. Married in 1713 at Kirkby Malzeard to John Auton. of Hornby. ANNE THWAITES. Bap 20.7.1771. dau of William. ANN THWAITES [Nee Spence.] Born 1818. Married Simon [1808-1859]. ANN THWAITE. Bap.25.12.1845 Kirkby Malzeard. Born Azerley. Dau of William [the Watcher] & Elizabeth. ANN THWAITES. Bap. 9.1.1848 Kirkby Malzeard. Born Azerley. Dau of Thomas & Margaret of Azerley. ANN THWAITES [Nee?]. Born C 1855. A widow of Grewelthorpe. Married Christopher J. Ascough. Farmer. in 1904. ANNIE THWAITES. Born 31.9.1873. Dau of Barker Thwaites. [shoemaker] & Lizzie. Started at Grewelthorpe school in November 1876. Left in 1877. ANN THWAITE. Born C. 1883. Drowned June 1928. Lived Ivy House, Grewelthorpe. Suicide. Drowned in river Ure at Hackfall on 7.6.1928. Step daughter of C.J.Ascough. See Funeral report at end. ANNIE THWAITES. Born 24.3.1892. Dau of Ann. Started Grewelthorpe school August 1901, Left 1904. She returned to school in 1905. [This is possibly the same Annie as above]. ANTHONY THWAITES. Died 1808. Yeoman of Masham. ARTHUR THWAITES. Born C. 1855. in Kirkby Malzeard. Son of John & Ann. Husband of Elizabeth [Lizzie]. A cordwainer. Living Grewelthorpe in 1891. He was a Parish Councillor from 1901 – 1904. In 1911 he was a widower and living with son John in Grewelthorpe. BARKER THWAITES. Born C1848  Kirkby Malzeard. Son of John [The Cordwainer] & Ann. Married on 21.1.1871 at Kirkby Malzeard to1 to Elizabeth Coldbeck. of Grewelthorpe. [b.1847] dau of John Coldbeck. He was widowed in 1881 and Married  to Sarah of Masham. He was a Master Shoemaker. Died 29.10.1922 in Ripon Workhouse. Age 71. He had senile decay. BROADLEY [or Bradley] THWAITES. Born C. 1875 Kirkby Malzeard. Son of Barker [Shoemaker] & Lizzie. CHRISTOPHER THWAITES. Bap. 8.2.1778. Son of John. Possibly the butcher who married Elizabeth. Buried 3.6.1855. Grewelthorpe. DORIS THWAITES. Born 17 March 1907. Living Greenhow Hill Pateley Bridge in 1939. EDWARD THWAITES. Born C. 1759. Buried 7.8.1849 aged 80. Kirkby Malzeard. EDWARD THWAITES. Bap 26.5.1769 Son of William. EDWARD THWAITES. Bap 28.7.1771. Son of John. EDWARD THWAITES. Born C. 1829. Married to Elizabeth born 1839 Sawley. Living Galphay in 1881. ELIZABETH THWAITES. Born May 1744 Masham. Died Aug. 1824 East Witton. Dau of Thomas & *Grace Folthergill. Married to William Jeff. at Masham on 9.2.1775. ELIZABETH THWAITES [nee?]. Born C 1766. Buried 15.12.1852. Grewelthorpe. Wife of Christopher Thwaites the butcher. ELIZABETH THWAITES. Bap 11.12.1768 Son of John. ELIZABETH THWAITES. Born C.1825. Buried 4.3.1840 Kirkby Malzeard. ELIZABETH THWAITES [nee ?]. Born C. 1861 Grewelthorpe. Wife of Arthur the Cordwainer. ELIZABETH THWAITES. Born C. 1862 Kirkby Malzeard. Dau of Henry & Esther Ellis. ELIZABETH THWAITES. Born C. 1876 Studley Roger. Dau of Edward & Elizabeth. ELLEN THWAITES [nee ?]. Born C. 1787 Grewelthorpe. Wife of John the Tailor. In 1861 Ellen was living in Winksley. ENOCH THWAITES. Bap 15.4.1888. Buried 20.4.1888 age 3 weeks. Son of Arthur & Lizzie. ERNEST THWAITES. Born C. 1879 Kirkby Malzeard. Son of Barker [Shoemaker] & Lizzie or Sarah the laundress. ERNEST THWAITES. Born 25.10.1918. Bap 20.11.1918. Illeg son of Violet. Born in Ripon Workhouse. GEORGE THWAITES. In 1712 he was one of the Masham Parish 4 & 20. he could not write his name. He agreed to the sale of a pew in Masham Church to Mr Thomas Hardcastle. GEORGE THWAITES. Bap. 11.5.1777. Son of William. GEORGE THWAITES. Bap.12.10.1845 Kirkby Malzeard. Son of John [The StoneMason] & Sarah. Married on 24.4.1869 at Kirkby Malzeard church to Mary Ellis. [b.1843] dau of John Ellis. the Butcher at Kirkby Malzeard. George was a stonemason. GEORGE THWAITES. Born C.1868 Kirkby Malzeard. Son of Sarah the laundress. Possibly the son of Barker Thwaites the shoemaker. George was a Painter. HANNAH MARIA THWAITES [nee Jones]. Dau of David Jones a collier in Wales. Married John Thwaites in June 1913. HARRY THWAITES. Born 2.4.1908. Son of Amelia. Started Grewelthorpe school April 1915. Moved away to Kirkby Malzeard in 1920. HENRY THWAITES. Bap. 25.11.1811 Kirkby Malzeard. Son of Thomas of K.Malzeard. HENRY THWAITES. Born C. 1837 Kirkby Malzeard. son of John the Mason. Henry was a Stonemason. Married on 6.4.1861 at Kirkby Malzeard church. to Esther Ellis.[b. 1838] dau of John Ellis. Living Kirkby Malzeard 1861. Died 1906. HERBERT THWAITES. Born 6.10.1889. Son of Ann. Started Grewelthorpe school August.1901. left 1904. Ann married Christopher James Ascough. in 1905 and they lived Ivy House, Grewelthorpe. See Ascough page. 1911 Herbert was an assitant carter & carrier. HERBERT THWAITES. Born 1.6.1910. Bap 9.5.1915. Son of Amelia. Lived Cross Hills, Grewelthorpe. Started Grewelthorpe school April 1916 left aged 14 in 1924. ISABELLA THWAITES. Born C. 1782. Buried 19.8.1853 Mickley. Lived Littlethorpe. JANE THWAITES. Born Grewelthorpe. Married Peter Farmery. of Bishop Monkton on 13.1.1694.JANE THWAITES. Married in 1713 at Kirkby Malzeard to Peter Ballan. of East Witton. JANE THWAITES. Bap. 7.3.1779. Buried 16.5.1790 Grewelthorpe. Dau of William. JANE THWAITES. Born 1832 Crakehall. Dau of Simon & Ann Spence. She had illeg. son William born 1850. JANE THWAITES. Born C. 1839. Buried 30.1.1840 Kirkby Malzeard. JANE THWAITES. Born C. 1860 Sawley. Dau of Edward & Elizabeth. JOHN THWAITES. Buried 25.9.1732 Kirkby Malzeard. Will proved 3.10.1732. Lived Grewelthorpe. JOHN THWAITES. Bap 19.6.1773 Son of William. JOHN THWAITES. Buried 10.3.1788 Grewelthorpe. Will proved 17.7.1789. John was a sievemaker. This could be the John who owned 4 acres of land at Labour Hill, Low Moor according to the enclosure award of 1782. JOHN THWAITES. Born C. 1794. Husband of Ellen of Grewelthorpe [bC1788]. A Tailor. 1861 lived at Woodhouse, Winksley. Had Grandson Thomas Inkerman Hall. born 1856 Ripon. Stewart Hall submitted the following observation. [Thomas Inkerman Hall was born on 5th November at Ripon. The middle name Inkerman may have been because his birth was on the 1st anniversary of the Battle of Inkerman in the Crimean War]. JOHN THWAITES. Born 1822 Kirkby Malzeard. Died 1898. Boot & Shoe Maker. Married Ann of Laverton. Father of Barker Thwaites. JOHN THWAITES. Bap. 5.10.1862 Kirkby Malzeard. Son of Thomas [a mason] & Sarah of Kirkby Malzeard. JOHN THWAITES. Bap. 23.11.1862 Kirkby Malzeard. Son of Edward & Elizabeth of Galphay. JOHN ALFRED THWAITES. Born C. 1872 Kirkby Malzeard. Son of Barker the shoemaker. & Lizzie. JOHN THWAITES. Born 12.4.1880.Grewelthorpe. Son of Arthur & Lizzie. Started Grewelthorpe school in May 1885. Left 1890. Married Hannah Maria Jones in June 1913. His sister Maggie Prest was witness at wedding. JOSEPH THWAITES. Bap. 15.3.1859 Kirkby Malzeard. Son of John [The shoemaker] & Ann. JOSHUA THWAITES. Bap. 15.3.1859.Kirkby Malzeard. Son of John [The Shoemaker] & Ann. Joshua was a Stonemason. Married Ann Chapman of Dallowgill. Ann had twin daughters Hilda & Maud Chapman born 1882 in Tockwith. Ann & Joshua had a son Herbert born 1890. [Ref. 1891 census Kirkby Malzeard]. LIZZIE THWAITES [Nee ?]. Born C.1847 Grewelthorpe. Married Barker Thwaites. LIZZIE THWAITES. Born 21.5.1915. Dau of John. Started Grewelthorpe school April 1922. Coming from Kirkby Malzeard. left in 1923 to go to Wath. LIZZIE THWAITES. Born 10.3.1918. Started Grewelthorpe school April 1925. Left age 14 in 1932. MABEL ANN THWAITES. Born 9.9.1902. Bap. 30.9.1902. Possibly dau of Amelia. Neice of John [b.1880] . [ref.1911 census] Started at Grewelthorpe school in June 1910 having come from Navigation School in York. She left school aged 14. MAGGIE THWAITES. Born 2.6.1883 Grewelthorpe. Died 26.6.1952 Kirkby Malzeard. Dau of Arthur & Elizabeth. Married in 1900 to Robert Henry Prest. see photos above. MARGARET THWAITES. Bap 30.9.1771. Dau of Thomas. MARGARET THWAITE. Born C.1823 Kirkby Malzeard. Died 1901. Dau of John the Tailor & Ellen. Married Joseph Hall. [1822-1889] on 23 Oct 1847 in Manchester had 6 children. John,Peter,Edward,Thomas,William & James. In 1871 living in Ripon. Joseph was a pipe maker. MARGARET THWAITES. Born 1857. Dau of John [The Shoemaker]& Ann. of Grewelthorpe. MARGARET THWAITES. Born C. 1870 Galphay Woods. Dau of Edward & Elizabeth. MARMADUKE THWAITES. Will proved 13.2.1757. MARMADUKE THWAITES. Born C. 1775. Lived Mickley. Buried 14.8.1841 Kirkby Malzeard. MARMADUKE THWAITES. Bap. 11.2.1781. Son of William. MARY THWAITES. Bap. 28.10.1775. Buried 12.11.1791 Grewelthorpe. Dau of John. MARY THWAITES. Bap. 16.1.1848 Kirkby Malzeard. Born Azerley. Dau of William [The Watcher] & Elizabeth. MARY THWAITES. Bap. 3.6.1860 Kirkby Malzeard. Dau of Thomas [the Mason] & Sarah. MARY ANN THWAITES. Born C. 1864 Kirkby Malzeard. Dau of Henry & Esther Ellis. MILES THWAITES. Born C. 1871 Kirkby Malzeard. Son of Sarah the laundress. More likely to be the son of Barker Thwaites the shoemaker and Lizzie. Barker Married  Sarah of Masham. Miles was a Boot riveter in 1891. MINNIE THWAITES. Born C.1897 Kirkby Malzeard. Dau of Ann. In 1905 Ann married Christopher James Ascough and they lived at Ivy House, Grewelthorpe. See Ascough page. ROBERT THWAITES. Vicar of Masham Church. resigned 20.2.1448. Ref. History of Masham – Fisher 1865. ROBERT THWAITES. Born C. 1837 Winksley. A Carter. Married Martha Burton. [b.1840]. Living with her Mother Bridget Burton in 1861 in Winksley. ROBERT RUDD THWAITE. Bap 25.12.1845 with his sister Ann at Kirkby Malzeard. Born Azerley. Son of William [The Watcher] & Elizabeth. SARAH THWAITES [Nee ?]. Born C.1836 Masham. Widow in 1881 in Kirkby Malzeard. Laundress. 5 children. As youngest child was age 1year. Husband probably died in 1880. SARAH THWAITES. Born 1843 Fearby. Died 1921 Bedale. Dau of Simon & Ann Spence. [b.1818] Married Abraham Braithwaite. [1841-1908] in 1861 at Bedale. had 10 children. SARAH ANN THWAITES. Born C 1859 Liverpool. Married Robert Robson. of Grewelthorpe. Living Masham 1881 also sister Mary E Thwaites. SIMON THWAITES. Born 1808 Kirkby Malzeard. Died 1859 Bedale. married Ann Spence. in June 1842. had 2 dau. Jane & Sarah. THOMAS THWAITES. Born C1715 East Witton. Son of Jo. Married Grace Fothergill. 21.11.1737 Masham. THOMAS THWAITES. Born C.1744. Lived Mickley. Buried 10.6.1821. Ref. Kirkby Malzeard Parish Reg. THOMAS THWAITES. Bap. 31.10. 1773. Son of John. Possibly the Thomas who lived in Mickley and was buried 1.7.1843 Kirkby Malzeard. THOMAS THWAITES. A Mason. Married on 4.11.1797 at Kirkby Malzeard to Elizabeth Gill. Witness Edward Thwaites. THOMAS THWAITES. A stonemason in Kirkby Malzeard in 1822 Baines Directory. THOMAS THWAITES. Born C. 1834 son of John the Mason. Thomas was a Mason. He married Sarah Broadley. [b.1836] dau of John. Married on 21.5.1859 at Kirkby Malzeard church. THOMAS THWAITE. Born C.1838 Kirkby Malzeard. Son of John the Tailor & Ellen. THOMAS THWAITES. Born C 1852 Kirkby Malzeard. Son of John [the shoemaker] & Ann. THOMAS THWAITES. 1890 Cabinet Maker in Masham. Ref. Bulmer’s 1890 Directory. THOMAS THWAITES. Born C.1880. Kirkby Malzeard. Grandson of Barker [Shoemaker]. THOMAS ANTHONY THWAITES. Born 8.3.1889. Bap 2.5.1889 Grewelthorpe. Son of Arthur & Lizzie. Started Grewelthorpe school June 1892. Left 1903. 1911 he was a postman living with brother John & widowed Father. Thomas was killed in October 1913. See newspaper report below. THOMAS THWAITES. Born 20.10.1913. Son of John. Started Grewelthorpe school in April 1922 having come from Kirkby Malzeard. left in 1923 to go to Wath. VIOLET THWAITES. Of Ripon. Had an illeg. son [Ernest] in Ripon workhouse in 1918. WILLIAM THWAITES. Bap 22.6.1766. Son of John. WILLIAM THWAITES. Bap. 4.2.1775. Son of William. WILLIAM THWAITES. Bap. 30.1.1850 Kirkby Malzeard. Son of William [The Watcher] & Elizabeth. WILLIAM THWAITES. 1890 A Basket Maker in Masham. Ref. Bulmer’s 1890 Directory. WILLIAM THWAITES. Born 27.12.1920. Son of Ann who married C.J.Ascough. Started Grewelthorpe Junior school April 1928 having been in the infants class. Left age 14 in 1934. Brought to school by C.Ascough his step Father. WINIFRED THWAITES. Born 6.9.1896. Dau of Ann. Started Grewelthorpe school August 1901, Left 1904. Report in Ripon Gazette October 9th 1913.An inquest was held on the body of Thomas Anthony Thwaites. aged 24years of Grewelthorpe, a carter in the employ of Mr. Hubert Greenwood. of Bramley Grange. who died in hospital on Monday afternoon at 2-30p.m. as the result of being thrown out of a milk cart that morning. Deceased had left the farm at 8-30a.m. with 10gallon of milk to take to the dairy and he also had 3 school children in the cart. Shortly after leaving the farm the deceased struck the horse, which jumped to the opposite side of the road, breaking the back band of the harness. The shafts of the cart were broken off and dropped to the ground and the deceased was thrown on to his head. Dr. Harvey. of Kirkby Malzeard was sent for and advised deceased’s removal to the Cottage hospital where he died from a fracture of the skull.John Thwaites. of Grewelthorpe stated that the deceased was his brother. About 12 noon the witness was sent for to see his brother who was in a barn at Mr Coldbeck’s Bramley Grange. he was then unconcious. In the meantime the ambulance had been sent for and about 1-30p.m. the deceased was removed to hospital. The witness accompanied him.They reached the hospital at 2-25p.m. and witness stayed with his brother who died 5 minutes later. the deceased was used to horses and had previously been engaged timber leqading with three horses.Mrs Mary Jane Coldbeck. of Bramley Grange, Grewelthorpe stated that on Monday morning she was on the Bramley road about 8-45a.m. just below the gate of her house, a little girl was with her. They were gathering brambles. Deceased came down the road with the milk cart. It was an ordinary spring cart and deceased was driving the horse which seemed as if coming to a standstill. the horse did not shy. The horse was coming down the hill in a sleepy sort of way, when deceased struck it with a stick. The horse bounded forward and got off the road. The wheel on the nearside went over some sidings and then into a gully at the side of the road. The horse cleared the cart & harness, the shafts were broken and the horse had nothing left on but the collar & reins.There were 2 of Mr. John Thackray’s girls in the cart and Mr Greenwood’s little boy. These were thrown out except the boy who sat in the bottom of the cart. Witness found the deceased sitting in the middle of the road. He was moaning but did not speak. Wtiness’s husband and Mr Armstrong were within call and she went for other help. She returned a few minutes later and deceased was laid on side of road. He was then vomiting but did not speak. He was moved to Mr Coldbeck’s Barn with the help of neighours.Mr Hubert Cook Greenwood. of Fir Tree House, Bramley Grange, farmer, stated that the deceased had been in his employ and had been with him about 10 days. At he time the accident happened he was taking milk to the dairy at Kirkby Malzeard, and had been in the habit of doing that. He had had no trouble with the horses before. It was a quiet horse, 5 years old. It had however run away in the Spring thro’ carelessness. It was not a high spirited horse, but rather nervous. It had taken milk to the dairy from being 2 years old.The Doctor reported that here had been a delay of an hour and a half in starting with the message for the ambulance owing to the difficulty of findong a horse, and it was 11-20a.m. before a man se off to Ripon. He attributed death to compression of the brain caused by a depressed fracture. The jury returned a verdict that deceased was accidentally killed by being thrown from a spring cart and died from compression of the brain the result of a compressed fracture. Report of funeral of Ann Thwaites in Ripon Gazette 14 June 1928.The funeral of the late Annie Thwaites. took place on Wed. afternoon June 6th at St. James Church, Grewelthorpe. when there was a large attendance of relatives & friends. An impressive service was conducted by Rev F.Hewitt [Vicar of Mickley] & Miss A.J.Richmond presided at the organ. The chief mourners were:-Mr H.Thwaites – Brother. [Probably Herbert]Miss W.Thwaites – Sister. [Probably Winifred]Mr. C.J.Ascough – Step Father.Mrs Lofthouse – Aunt.Mrs Ashby – Cousin.Mrs Prest: Miss M. Thwaites: Mr Bert Thwaites – Cousins. ==Any other information about Thwait – Thwaite or Thwaites. of the Grewelthorpe area needed.